(BBG) Norway’s Wealth Fund Proposes Oil, Gas Stock Exit. 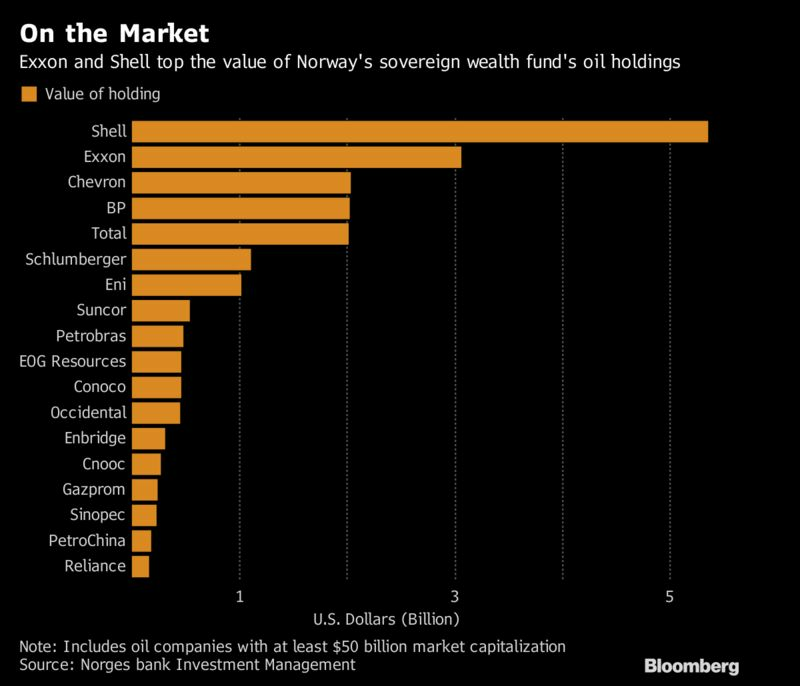 The $1 trillion fund that Norway has amassed pumping oil and gas over the past two decades wants out of petroleum stocks. While the fund says the plan isn’t based on any particular view about the future of oil prices or the industry as a whole, it will likely add to pressure on producers already struggling with the growth of renewable energy supplies. The Stoxx Europe 600 Oil and Gas index reversed gains after the announcement, sliding 0.3 percent as of 3:47 p.m. in London. Built on the income that western Europe’s largest energy supplier has generated for more than 20 years, the fund’s investment decisions are guided by ethical rules encompassing human rights, some weapons production, the environment and tobacco. Norway’s fossil-fuel investments are coming under increasing scrutiny from a public that aims to be a climate leader without jeopardizing one of the world’s highest standards of living. The fund has doubled in value over the past five years and was just given the go-ahead to boost its stock holdings to 70 percent of its portfolio from 60 percent to help drive returns. The government, which also controls Statoil ASA and offshore oil and gas fields, was forced to withdrew cash from the fund for the first time last year to meet spending commitments after oil prices dropped. Matsen said “now is a good time” for the proposal because otherwise the new 70 percent threshold will result in the fund buying even more oil and gas shares because it tracks indexes that include such stocks. The fund has a small amount of leeway to make individual investments and wants to keep oil and gas in its “investment universe,” he said. The fund said it doesn’t expect returns or market risk to be affected “appreciably” by its proposal, emphasizing that cutting exposure to the energy industry would allow it to crank up investments in other sectors. Finance Minister Siv Jensen said the government will give the plan careful thought. But environmental groups praised the plan. “The world is changing fast, and it’s very risky to put too many eggs in the same basket,” said Marius Holm, the leader of the Zero Emission Resource Organisation. Sony Kapoor, a former adviser to Norway’s government, said the plan is “a belated victory for common sense over the powerful oil and gas lobby in Norway,” calling on the fund to now boosts its “green” investments at least tenfold. The recommendation also received backing from the Conservative-led government’s support parties, the Christian Democrats and Liberals. The Labor Party, the biggest opposition group, said it would like to study the proposal before making a decision. “The government is responsible for the Norwegian economy as a whole and must take a broad and comprehensive approach to this issue,” Jensen said in a statement.